Uptown Update: Can You Dig It? 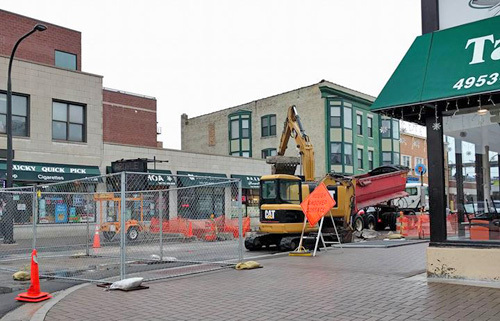 Work began this week digging up the street pavement on Argyle immediately east of Broadway. When it's finished (currently scheduled for late July), the sidewalks and street will be at the same level. For an overview of the 2016 construction schedule, see here. Still maintaining this is both an incredible waste of money and insane from a safety viewpoint. I agree with you on both counts, Mike. If Ald. Osterman really believes this is in any way going to improve Argyle, he's more delusional than I ever gave him credit for--and that's saying something. What is going on with the large vacant dug out spaces every 50 ft or so that are currently just large trash cans? Many of the areas dont have evenly layed bricks and are a tripping hazard as well. I'll wait until the entire project is complete to really decide how I feel on it, but so far it reminds me of nothing better than the State Street Mall that was such a "success" ... So good or bad, we're stuck with this for a number of years regardless.